It's difficult loving to eat Japanese food and living in Salem. There are the few sushi places and noodle places, but it's nothing like LA or Seattle. As a student of the Japanese language & history and frequent reader of their comics (aka manga ), its nice to be able to eat the food one hears about so often. Japanese food is considered very healthy in its use of fish, soybeans, seaweed, and raw and steamed vegetables. Of course Japanese cuisine has its comfort foods too. Ramen Ichiban, on South Commercial, is a good example of Japanese comfort food. The menu contains noodle dishes, appetizers, and meat/rice combos. You can also order sushi. My husband and I, after going to the Asian market on Silverton road named A-Dong, felt like eating a Japanese lunch. I remembered seeing the ramen place down where the South Salem Joe's used to reside, now holding a Joe's Outlet and a thrift store. I love ramen (the fresh stuff you get in Little Tokyo in downtown LA not the 10 for a dollar stuff), so the name caught my attention right away. 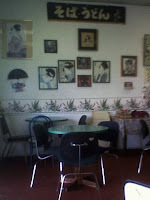 The restaurant is small with geisha art on every wall. We walked in and were greeted by a Japanese man and woman. I'm pretty sure they are the owners, as the man spoke about his recipes and his most popular dishes. He asked if we had ever eaten there before. When he found out we hadn't , he told us what he felt were his best dishes and highly recommended them. Even though I was tempted by the noodle dishes like the Miso Ramen, I went with his first recommendation as it isn't quite soup weather yet. I ordered the Chicken Kastudon which is chicken breaded in panko with an omelet mixture poured on top. The meal came with my choice of yakisoba or rice. I chose yakisoba. My husband ordered the Teri Chicken (chicken teriyaki) with yakisoba. We both ordered green tea. The prices were okay. They average about $7 an entree, extra for the noodles instead of rice, and $1.50 for the tea. You have to keep in mind this is a "bento" place which specializes in quick hot lunches, traditionally served for convenience. A bento's ratio is normally - 1/2 rice, 1/4 meat and 1/4 vegetable and cost around $7 a lunch. Our lunches came out on styrofoam plates. I grabbed some plastic wear and napkins and sat down to eat. I would have preferred chopsticks, but it wasn't a huge problem. I personally think yakisoba is easier to eat with chopsticks, but not necessary. My chicken looked awesome. It was a nice big filet , with a good portion of noodles. When I took a bite, the chicken was a little tough. It got better as I ate my way into the thicker part of the filet. The marinade sauce was addicting and the noodles tasted just like yakisoba should -- sweet and spicy (not hot, but lots of spices). The veggies were a little soggier than I would like, but tasted good. They consisted of pickled cucumbers and napa cabbage. My husband's Teri Chicken tasted a little tough in some bites too, but the sauce was perfect. Japanese teriyaki sauce is not supposed to be sweet as so many American teriyaki places serve. The sauce was lightly sweet, mostly consisting of soy sauce, ginger, and, probably, mirin. 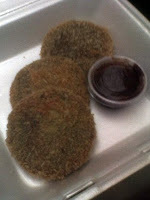 I wanted to try the croquettes, so I took a few to-go. I'll let you know later how they are. They look and smell great! All in all, this place was good. It wasn't awesome, but they serve foods most Americans will never taste in a lifetime. That alone is a good reason to come eat a nice lunch at Raman Ichiban. The ambiance leaves much to be desired, but the food is decent and authentic. I am planning to go back and try the ramen this fall. Edit 9/20/2008: I ate the croquettes over a 2 day period for snacks & lunch. They were awesome! Even reheated in the microwave, they were crunchy on the outside and soft on the inside. They were filled with potatoes and a little shredded pork and curry spices. I think the dipping sauce was a Korean bbq or hoisin sauce. Thanks for being a taster for this place. I've wondered for a long time if RI was any good. Now I'll have to give it a try. Good review! I'll definitely check it out after reading this! I love this place. Authentic and friendly Japanese fast food, hard to find in Salem. Just got back from San fransisco and I am already starting to crave some good Japanese food. 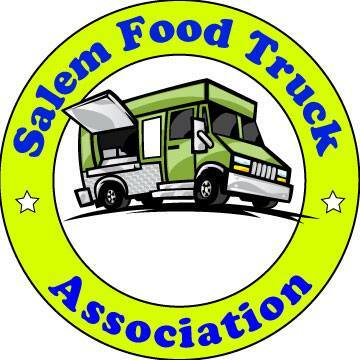 This is as good as it gets in Salem for a fast fix. Best of all the owners are Japanese. Ramen Ichiban is the best. I grew up in Salem and moved out to the east coast four years ago. The first places I go when I visit home are Ramen Ichiban and La Hacienda. The owners of RI (the couple you mentioned) are so sweet, the teriyaki sauce is amazing (his own recipe), and the yakisoba noodles are my favorite. Now you've got me craving RI, time for a visit home. Their food is AWESOME. Our whole family loves to order it and take it home. But we will NEVER, ever eat in the restaurant. I don't think I would sit down on their chairs unless I had a plastic bag to toss over them. I remember when this place first opened and we would go in there and sit and read and chat for hours. I don't think they've cleaned the chairs since then. We still order take out about every other week. But there's *never* anyone actually IN the restaurant. Maybe they all feel the same. I definitely concur with the comments about how friendly the couple is and how good the food is. Whenever I have the money, it's a good and cheap fix for authentic Japanese cuisine on the go. I have no idea what that last guy was saying about not eating in, though. I always eat in. I've never had a problem with the chairs or cleanliness. Actually, I like the ambiance. It may not be 4-star, but it's as comfortable as my favorite hole-in-the-wall diners and cafes. Chopsticks are often available upon request from the couple, too, so if you prefer those, don't be afraid to ask! I recommend the Kahlua pork with the Soba noodles. im about to try it tuesday man!!! It's been a while since I've been here. I think I had Teriyaki Chicken with rice and veggies. 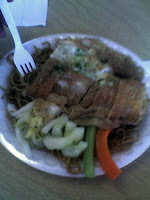 I have also, on another visit had their yakisoba noodles. The food is good, but what really impressed me was the treatment I received here. The rice was so perfect, I asked the cook what brand he used. He not only told me, he brought the bag out so I could see the label. I thought that was above and beyond and I appreciated it. I'm really shocked by the overwhelmingly positive comments here, I tried this place for the first time a month or two ago after reading some of the comments about it. You walk in and it smells like the whole restaurant has been in a deep fryer, the chairs and the carpets are covered in a multitude of different stains. The food quality (that night at least) was fast food at best. I'm not Japanese so I can't really say about the authenticity, but the menu to me seemed to consist mostly of fried foods & noodles and I didn't see any sushi on the menu. The only plus I can say about this place is that the owner and his wife seemed nice. I had Curry Croquettes, which were delicious, and Yakisoba Noodles. My bride had Miso Ramen, which she liked. The owners were courteous, as always. Although the decor and furnishings are a bit austere, I've never found the place unclean as others have mentioned and I'm usually very tuned in to poor housekeeping. The same can be said for reported cooking odors, if they’re there, my nose will detect them and it never does here. The windows were a little fogged, which might trouble some, but we found the place very comfortable today. When I first tried it, it was the only Japanese place I was aware of in Salem. There's lots of competition now, but Ramen Ichiban still seems to be getting its share of the market.